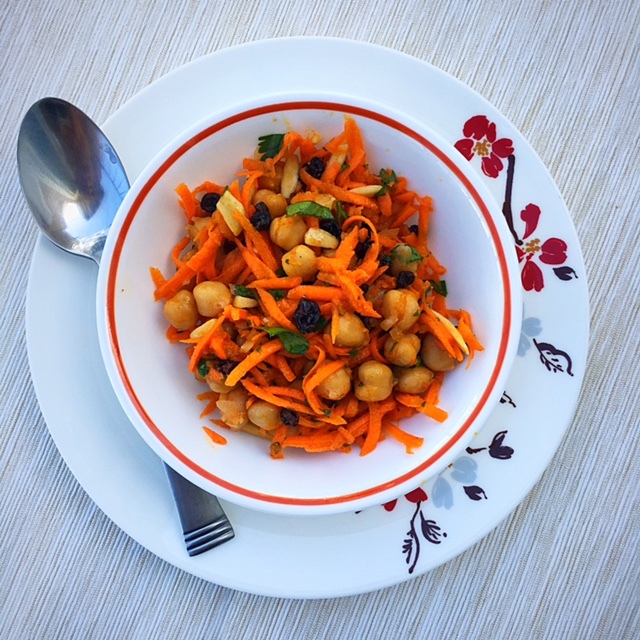 This vibrant, flavorful, Carrot, Chickpea Moroccan Salad is delish! Plan on getting addicted to this anything-but-boring salad recipe and add it to your weekly rotation. While the salad ingredients are quite simple, it’s the salad dressing that will “Wow” you. The dressing is packed with Moroccan spices like cinnamon, cumin, coriander, ginger, lemon, and orange. Follow these simple recipe tips for a flawless recipe each time! Use your food processor’s grating blade to shred the carrots at home to cut down on the cost of buying pre-shredded carrots. Toasted slivered almonds have much more flavor and crunch than the raw variety. I buy mine at Trader Joe’s. If you can’t find them toasted, just pour them onto a dry saute pan on low heat for a few minutes until slightly browned. Zest the lemon and orange prior to juicing them. Avoid zesting into the white portion of the peel because it tastes quite bitter. If you dislike cilantro, swap it out with fresh mint leaves. I use jarred minced ginger in this recipe, which helps save time peeling and mincing fresh ginger root. You can also use dry ginger powder, but cut down by half the amount. Combine all of the salad ingredients together in a large mixing bowl. Set aside. Whisk together all of the dressing ingredients together in a small bowl. Pour over the salad and mix until well combined.